White paper on crime 2001 Part3/Chap.1/Sec.2/1. Fig. III-6 shows the trends in the number of juveniles referred by the police for special law offenses excluding violations of traffic-related laws since 1956, the year when Criminal Statistics by the National Police Agency started to identify details of juvenile special law offenses (see Appendix III-6 ). 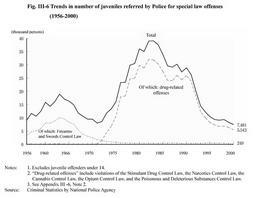 The trends in the total number of juveniles referred for special law offenses have shown its peak twice:in 1963 at 18,967 and in 1983 at 39,062. Examining offense categories, Firearms and Swords Control Law violations had the largest share in the number of juveniles referred for special law offenses between 1955 and 1964. By contrast, drug-related offenses have increased significantly since the early 1970s. Poisonous and Deleterious Substances Control Law violations account for an overwhelming majority of juvenile drug-related offenses, followed by Stimulant Drug Control Law violations.